Tentenō, the gesaku (戯作) writer Takabatake Ransen, adds 戯記 rather than the usual 記 (ki) or 誌 (shi) after his name. He also signs TNS-781, TNS-913b, and TNS-1036b this way -- reminiscent of 戯筆 (girefude) or "frivolous brushing" in Yoshiiku's signature on the frontispiece of Kanagaki Robun's Aguranabe. 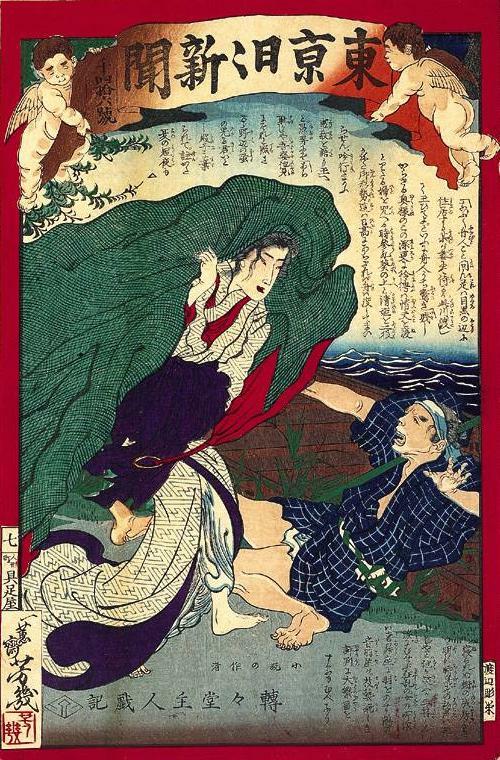 Otohaya (音羽屋 Otowaya) is the stage name of the Onoe Kikugorō family of kabuki actors. Terashima Kiyoshi, a third generation grandchild of Kikugorō III, was known as Ichimura Uzaemon XIII, among other names, until becoming Kikugor#333; V from 1868. He also styled himself Ichikawa Danjōrō IX (1844-1903). The Kishōza (喜昇座), which opened in 1873 in Hisamatsuchō in Nihonbashi, was remodeled and reopened as Hisamatsuza in 1879. After a 1880 fire it was rebuilt and reopened as Chitoseza in 1885. Destroyed by fire again in 1890, it was rebuilt as Meijiza in 1893. Several generations, earthquakes, wars, and buildings later, the Meijiza continues to be a major Tokyo theater. Tentendō Shujin was one of several pen names used by the gesaku writer Takabatake Ransen. He also styled himself as a "writer of minor stories" on TNS-101 and TNS-1054.